HotSchedules for Android is an employee scheduling app that makes it fast and easy to manage schedules and communication within your team. It manages work life balance really well. It is of great help for managers when you can easily build schedules and manage one click approvals for changed. This workforce management app is designed to be used for any kind of industry. It can be used in hotels, retail, and hospitality industries and also in other businesses. It quickly automates most of the tasks involved in a business. 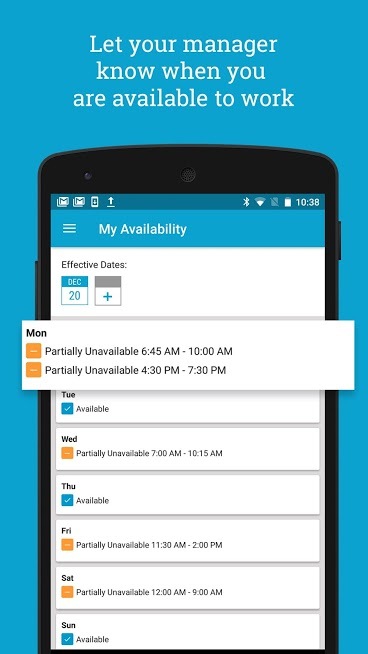 HotSchedules Employee Scheduling app for Android gives different level of access for each designation and the users can have access only to those folders. For one location, the app can support up to 30 users. Apart from scheduling, it gives abundance of reports from which data can be culled for further examination. Even though the app was initially based on restaurant business, it can be customized to suit any other business needs. The interface is intuitive with interesting features. The homecoming screen is divided into two vertical columns. The left one is called My Plates and will have schedules for the next two weeks. The right side has users profile, videos, private and also group messages. Personal settings maintain users information that can also be updated when needed. Most operations can be performed from the home screen itself whether to pick up or release shifts, request time off, set availability and notifications. Link schedules and shift information to Google Calendar so you can be always aware of your schedules. In-app messaging channel is available so you could easily contact colleagues. HotSchedules Employee Scheduling for Android operates on a cloud based platform that makes it accessible and operable worldwide anywhere anytime. It is especially useful for those who prefer using smart devices to manage work and life. It gives you real time reports on budgets, costs and other metrics. The app is available in English and Spanish languages. To use the spam you will need a valid HotSchedules account. The app costs $2.89 to download from Play Store.